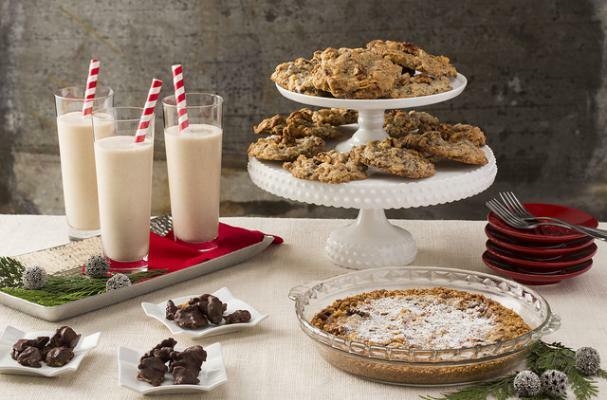 This holiday season, California Walnuts and award-winning pastry chef Christina Toss, founder and brilliant baker behind New York’s famed Milk Bar (sister bakery to Momofuku), have teamed up to create four delicious holiday dessert recipes. The fun and festive treats are twists on Milk Bar customer favorites as well as surprising spins on classic desserts. These drool-worthy recipes combine the creativity of Milk Bar’s playful sweets with the nutty flavor of walnuts. Enjoy a Walnut Baklava Milkshake (spike it up with bourbon! ), a decadent concoction that combines the crispy sweet goodness of a classic Greek dessert with a vanilla shake, or whip up a batch of Sweet-Salty-Spicy Walnut Candy (excellent paired with a Moscow Mule or a Whiskey Sour to balance the sweetness of the chocolate and heat of the curry). 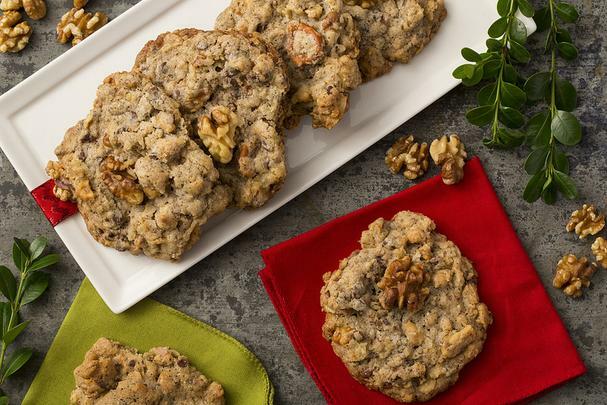 Or, bake up a batch of Walnut Compost Cookies or a scrumptious Walnut Oat Cookie Pie. All are perfect for the holiday season! Step 1. Heat oven to 375°F. Brush a 9x13-inch baking pan with some of the melted butter. Step 2. In a medium saucepan on medium heat, bring sugar, lemon juice and 1 ½ cups water to a boil. Lower heat and simmer for 10 minutes until ingredients reduced down form a syrup. Cool off­ heat. Step 3. In a food processor (or in a Ziploc bag with a rolling pin), pulse or break down walnuts with light brown sugar, cinnamon, and salt until finely ground. Step 4. Unroll phyllo sheets and using a sharp chef's knife, trace the base of the 9x13-inch baking pan, trimming the phyllo to fit. Step 5. Place 1 sheet of fitted phyllo in baking pan. (Keep remaining sheets covered with a damp cloth or paper towel otherwise they'll dry out!). Brush layer with melted butter; repeat with two more sheets of phyllo (three total). Step 6. Sprinkle 1/3 cup walnut filling on top layer of phyllo cluster. Repeat with seven more buttered phyllo stacks, sprinkling each with walnut filling. Top with one more stack of three. Brush the top generously with butter. Step 7. Using the same chef's knife, cut unbaked walnut baklava into 24 squares (6 x 4). Bake for 35 minutes until flaky and golden brown. Out of the oven, pour the saucepan of syrup over the walnut baklava. Let stand at room temperature for about 3 hours for walnut baklava to absorb. Step 1. Add 1 cup of the Walnut Baklava to the blender. Add 1 ½ cups vanilla ice cream and 1/2 cup whole milk. Blend on high for about 1 minute, agitating, or until the baklava breaks down into small pieces. Step 2. Pour into two 12-ounce glasses. Insert straw. Enjoy! 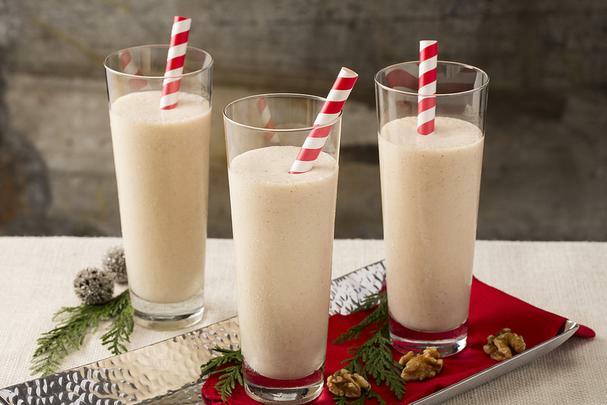 Tip: Spike the milkshakes by omitting ½ cup whole milk for ½ cup eggnog (or 3 oz. bourbon, ¼ cup whole milk), 1 tablespoon light brown sugar, and a pinch of nutmeg). Step 1. Heat a large, heavy bottom pan on medium-high until hot to the touch. Step 2. Add walnuts and butter to pan, stirring butter to melt and coat walnuts as they toast slightly. When walnuts are fully coated with butter, stir in sugar until melted and crystallized. Step 3. Pour candied walnuts out onto a baking sheet to cool completely. Step 4. Melt the dark chocolate gently in the microwave or on low heat over a double boiler on the stove. Step 5. Transfer cool, candied walnuts into a large, wide metal bowl, and with a rubber spatula, begin stirring, folding and tossing the melted dark chocolate over and into the walnuts. Step 6. Once fully coated in chocolate, wait 1-2 minutes for the chocolate to cool slightly. Step 7. 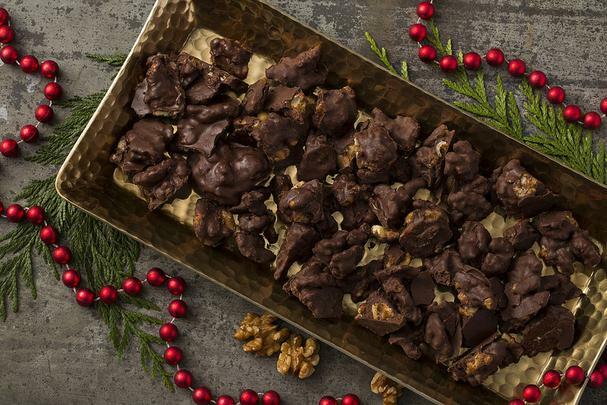 Toss Madras curry powder and kosher salt over the chocolate coated candied walnuts and stir, fold and toss until evenly coated. Step 8. Place candies in one layer in refrigerator and chill for at least one hour before serving. Store remaining candies in refrigerator. Christina recommends pairing candies with a Moscow Mule or a Whiskey Sour. The tart notes in these cocktails work well to balance the heat of the curry and dark chocolate. Step 1. Heat the oven to 300°F. Spread the walnuts on a baking sheet and toast lightly for 20 minutes. Cool completely. Heat the oven to 375°F. Step 2. Combine the butter, sugars, and glucose in the bowl of a stand mixer fitted with the paddle attachment and cream together on medium-high for 2 to 3 minutes. Scrape down the sides of the bowl, add the egg and vanilla, and beat for 7 to 8 minutes. Step 3. Reduce the speed to low and add the flour, baking powder, baking soda, and salt. Mix just until the dough comes together, no longer than 1 minute. (Do not walk away from the machine during this step, or you will risk over mixing the dough.) Scrape down the sides of the bowl with a spatula. Step 4. Still on low speed, add the chocolate chips, butterscotch chips, oats and co­ffee and mix just until incorporated, about 30 seconds. Add the potato chips, pretzels and walnuts, until just incorporated. Be careful not to over mix or break too many of these larger ingredients (especially the walnuts!). Step 5. Using a 2 ¾ ounce ice cream scoop (or a 1/3 cup measure), portion out the dough onto a parchment-lined sheet pan. Pat the tops of the cookie dough domes flat. Wrap the sheet pan tightly in plastic wrap and refrigerate for at least 1 hour, or up to one week. Step 6. Arrange the chilled dough a minimum of 4 inches apart on parchment – or Silpat-lined sheet pans. Bake for 18 minutes. The cookies will puff­, crackle, and spread. After 18 minutes, they should be very faintly browned on the edges yet still bright yellow in the center. Give them an extra minute or so if that's not the case. Step 7. Cool the cookies completely on the sheet pans before transferring to a plate or an airtight container for storage. *Corn powder can be found at natural food stores and ShopMilkBar.com. Step 1. Heat the oven to 350°F. Step 2. Combine the butter and sugars in the bowl of a stand mixer fitted with the paddle attachment and cream together on medium-high for 2 to 3 minutes, until flu­y and pale yellow in color. On low speed, add the egg yolk and increase the speed to medium-high and beat for 1 to 2 minutes, until the sugar granules fully dissolve and the mixture is a pale white. Step 3. On low speed, add the flour, oats, baking powder, baking soda, and salt. Mix for a minute, until your dough comes together and any remnants of dry ingredients have been incorporated. Step 4. Nonstick spray a quarter sheet pan and plop the cookie dough in the center of the pan and, with a spatula, spread it out until it is ¼ inch thick. The dough won't end up covering the entire pan; this is OK. Step 5. Bake for 15 minutes, or until it resembles an oatmeal cookie – caramelized on top and pu­ffed slightly but set firmly. Step 6. While warm to the touch, transfer the oat cookie to a bowl, crumble it diligently with your hands until it breaks down into a pebble like state. Step 7. Divide the oat crust evenly between 2 (10-inch) pie tins. Using your fingers and the palms of your hands, press the oat cookie crust firmly into each pie tin, making sure the bottom and sides of the tin are evenly covered. Step 1. Combine the sugar, brown sugar, milk powder, corn powder, and salt in the bowl of a stand mixer fitted with the paddle attachment and mix on low speed until evenly blended. Step 2. Add the melted butter and paddle for 1 to 2 minutes until all the dry ingredients are moist. Add the heavy cream and vanilla and continue mixing on low for 1 to 2 minutes until any white streaks from the cream have completely disappeared into the mixture. Scrape down the sides of the bowl with a spatula. Step 3. Add the egg yolks, paddling them into the mixture just to combine; be careful not to aerate the mixture, but be certain the mixture is glossy and homogenous. Mix on low speed until it is. Step 1. Adjust your oven to 300°F to prepare for toasting the walnuts. Spread all of the walnuts on a baking sheet and toast lightly for 20 minutes. Cool completely. Step 2. Heat oven back to 350°F and put both Oat Cookie pie crusts on a sheet pan. Divide 3 cups toasted and cooled walnuts between the two pie crusts. Divide and pour the pie filling evenly over the two pie crusts already filled with walnuts. Step 3. Bake for 15 minutes. The pies should be golden brown on top but will still be very jiggly. Step 4. Open the oven door for a minute and reduce the oven temperature to 325°F. Keep the pies in the oven during this process. When the oven reaches 325°F, close the door and bake the pies for 5 minutes longer. The pies should still be jiggly in the bull's-eye center but not around the outer edges. If the filling is still too jiggly, leave the pies in the oven for an additional 5minutes (every oven is a little different!). Step 5. Gently take the pan with pies out of the oven and transfer to a rack to cool to room temperature. (You can speed up the cooling process by carefully transferring the pies to the fridge or freezer if you're in a hurry. )Then freeze your pies for at least 3 hours, or overnight, to condense the filling for a dense final product – freezing is the signature technique and results in a perfectly executed Walnut Oat Cookie Pie. Step 6. 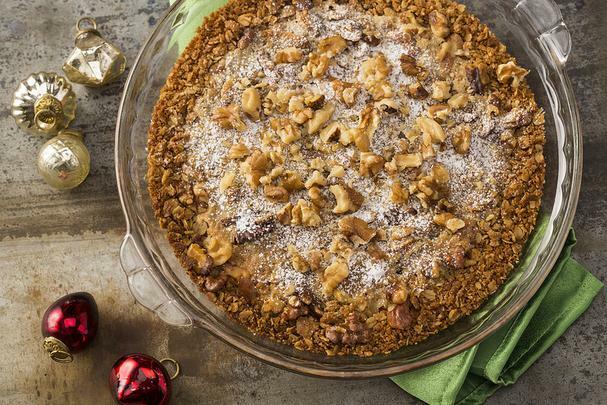 Decorate your pies with remaining 1/2 cup of toasted walnuts and dust with confectioners' sugar, either passing it through a fine sieve or dispatching pinches with your fingers. Slice and serve! Recipes courtesy of California Walnuts.